The Mets made a major announcement on Tuesday morning that is a statement about what they think this franchise can achieve going forward. The Mets signed 2018 National League Cy Young Award winner Jacob deGrom to a five-year extension. The deal will run through the 2023 season with a club option for the 2024 season. This follows a trend in baseball of teams locking up their franchise players before they hit free agency, such as the Angels locking up Mike Trout with a new 13-year, $430 million deal. Last season, deGrom became just the fourth Met to win the Cy Young, joining Tom Seaver (1969, 1973 and 1975), Dwight Gooden (1985) and R.A. Dickey (2012) in the exclusive club. The right-hander;s numbers in 2018 were staggering. He led the major leagues in ERA (1.70), opponent's slugging (.277), opponent's OPS (.521) and home runs per nine innings (0.41). He finished second in the majors in innings (217.0) and fourth in the majors with a career-high 269 strikeouts. DeGrom ended the year holding opponents to three runs or fewer in 29 straight starts, the longest single-season streak in major league history (min. 50.0 combined innings in those starts) and hurled 24 consecutive quality starts to end the season, the longest single-season streak in major league history. 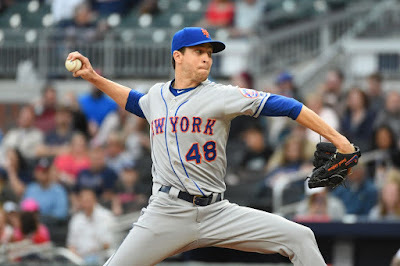 DeGrom was named to his second All-Star team in 2018 (his first was in 2015) and according to the Elias Sports Bureau, this was just the 10th time since 1920 that a pitcher had at least 200.0 innings and an ERA of 1.70 or lower in a season. He's the only pitcher in modern MLB history (since 1900) to have a season with a sub-2.00 ERA, at least 260 strikeouts, 50 or fewer walks and 10 or fewer home runs allowed.